Andres from Switzerland, his girlfriend, Paola from Brazil and I were riding on camels in the Thar Desert outside of the western Indian town of Jaisalmer. We were in a spot as remote as I’ve ever been, 21 hours by train from Delhi, just 60 kilometers from the border with Pakistan. It’s a flat, arid locale, punctuated by sand dunes and populated by only villagers, camel wallas and shepherds with their flocks of sheep and goats. To me it was a place that time forgot, more like the Middle East than India. It probably hasn’t changed much at all in a thousand years. I felt like a silk or spice trader heading west into the desert. I was deep into my reverie on a camel named Michael when suddenly my thoughts were interrupted by the Nokia ringtone. Dadadadadadadadadadadadada. It seemed our guide, Ali, was a very popular man. For the entire camel safari his cell phone rang. It rang on the sand dunes, it rang under the tree where we stopped to have our vegetables and chapati lunch, it rang at sundown while we were drinking our beer. It rang after we went to bed under the stars and it was the first sound I heard at sunrise. 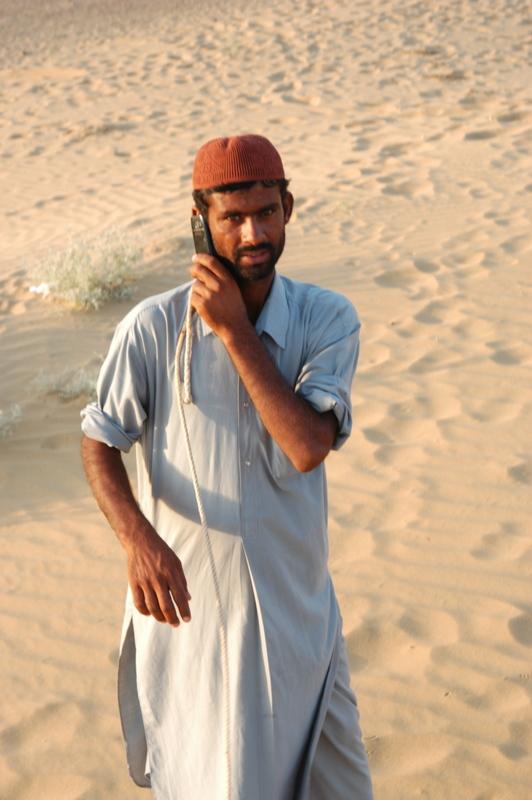 The Nokia ringtone, piercing the tranquility of the desert. The Lonely Planet guide book said the power generating wind turbines that have sprouted around Jaisalmer were altering the historic and mystical qualities of the area, that they made it harder to transport yourself to another time and place. But I barely noticed them. I found it was Ali’s cell phone that kept me coming back to now. I had a similar experience while working at the Olympics in Beijing. Dean, Jim and I took a day trip to hike the Great Wall of China. We climbed in Hebei Province, in Inner Mongolia, about two and a half hours outside of Beijing. We took a 10 kilometer trek from Jinshanling to Sumatai. Up and down stairsteps in a place far out of the way. Yet there was cell service. No place this remote would be served by AT&T in the U.S.A. My colleague, Jim, who probably shouldn’t have been on the adventure because he was so busy with his Olympic assignment as the head technical supervisor of the Bird’s Nest Stadium, spent the entire trip talking on his cell phone. I have no idea how he managed to catch his breath as he scrambled up and down the mountainside. It was truly the most difficult physical challenge of my life, yet he yakked the whole way on his mobile. We have gotten to a place where we are so interconnected that you can no longer escape, even in some of the most remote spots on earth. While in India I have stayed in touch with friends by Skype, email and Facebook. I tuned in to an computer chat on http://msnbc.msn.com that my friend, Kerry Sanders, a correspondent for NBC News, was holding as he covered the rescue of the miners from Chile. There was really no update from family, friends and colleagues that was inaccessible to me from a half a world away. And even though I am grateful for all the technology and connectedness at my fingertips, and understand the need of the camel walla to stay in touch with his people when he travels through the desert too, I still wish the only sounds that day were my thoughts, the wind and the camels, and not Ali’s incessant Nokia ringtone. Categories: Animals, China, Facebook, India, Inspiration, Media, Middle East, News and Views, Olympics, Random Thoughts, Social Networking, Technology, Television, Travel, United States of America, Women | Tags: AT & T, Beijing, Bird's Nest, brazil, Camel Safari, Chile, Chilean Miners, Delhi, Facebook, Great Wall of China, Hebei Province, India, Inner Mongolia, Jaisalmer, Jinshanling, Kerry Sanders, Lonely Planet, Middle East, Miners, MSN, MSNBC, NBC News, Nokia, Olympics, Pakistan, Skype, Sumatai, Switzerland, Thar Desert, U.S.A. | Permalink. Categories: China, Inspiration, Media, News, News and Views, Olympics, Random Thoughts, Television, Travel | Tags: Beijing, British Columbia, Canada, Canadians, Hockey, Olympic Games, Olympics, Vancouver | Permalink. One year ago I was in Beijing, China for a three month gig working at the Olympics. In November 2008 I headed to Kampala, Uganda again to do more television production work for BeadforLife (http://beadforlife.org) then immediately after a quick trip to Delhi, India for a wedding. No exotic destinations this summer but I’m hungry for an overseas trip. I’m already thinking about what to do for our 25th wedding anniversary in 2010. Saw this article about vacationing in Afghanistan. The land mines will be cleared out by October. Bamiyan seems like the place for an intrepid traveler to be. Categories: Africa, China, India, Inspiration, Middle East, Midlife, News, News and Views, Olympics, Random Thoughts, Travel, Women | Tags: Afghanistan, Bamiyan, BeadforLife, Beijing, China, Delhi, India, kampala, Olympics, Travel, Uganda, Vacation, Wedding Anniversary | Permalink. During April I’ve had a photo exhibit running in Studio 13 Gallery in Denver’s Santa Fe Arts District. It’s called “How People Live” and is a collection of photographs from the streets and slums around the world that illuminate the diversity of people and the condition of the poor. Photos were taken in Uganda, China, Thailand, India, Brazil, Mexico, and various places in America. Most of the photos were gathered while I was on television production assignments. “How People Live” was a fundraiser for the Colorado Coalition for the Homeless and I want to thank all the people who supported this effort. I’ve posted the photos to Facebook and Flickr and wanted to share them with a broader audience. Hope you find them compelling and enlightening. Categories: Africa, Arts and Culture, Children, China, Colorado, Community Service, Facebook, Global Poverty, Human Rights, India, Inspiration, Media, News, News and Views, Photography, Poverty, Social Networking, Travel, Women | Tags: America, brazil, China, Colorado Coalition for the Homeless, Denver, Facebook, Flickr, How People Live, India, Mexico, Photography, Santa Fe Arts District, Television Production, Thailand, Uganda | Permalink. The truth, my friend Song and I agreed, is somewhere in between. When people see things from completely different points of view, more than likely the reality lies in the middle. Song and I were having lunch towards the end of the Olympics in the International Broadcast Centre cafeteria and I asked her what she planned to do after the games ended. She said she’d like to return to Europe and travel around for a while. Maybe visit Serbia and Montenegro this time. Turns out since Song was a small girl she was told negative things about America that cloud her view to this day. I explained that the United States was not what she imagined, that it is diverse and she would be safe and welcomed warmly by Americans. Song has been out of China before. She received her Masters Degree in England and mentioned that as she got acquainted with her new classmates she was surprised that Westerners were not as she had been led to believe growing up. She found it all quite confusing and wondered if she had somehow been misled. I explained that if she visited America her experience would probably be very similar to that. In the end China was not how I imagined it would be. It is a fascinating, welcoming land with friendly, mostly content people. They work hard and enjoy life. Most in Beijing share in China’s prosperity and get along fine with the government. Many think the laws of the country are sensible. Confucious teaches obedience and it is embraced by the Chinese people. I was even surprised to know that some young Chinese are not willing to judge their leaders and recent history. It’s not because they are afraid but because they believe it is too new for them to have the perspective that comes with time. During the closing ceremony as the IOC’s Jacques Rogge complimented China on “exceptional games” he said, “through these Games, the world learned more about China, and China learned more about the world.” Hopefully that will be the enduring legacy of this time in Chinese history. The door will open a bit wider. Now as I sit home and reflect on the adventure I had I find myself missing China very much. I miss the yin and yang of the old China and new China. I miss evenings hanging out on the rooftops in the hutongs drinking Tsingtao beer with Chinese and Western friends. I miss walking down busy Beijing boulevards and seeing shops and lanterns and so many people coming and going on foot and bicycles. I miss tai chi in Behai Park. But mostly I miss Jack and Eir and Ming and Song and Sophie and Lynn and Matt and all the laughs. I especially miss the immersion into another culture and the opportunity to really see a country through the eyes of someone who lives there. One learns that despite what they’ve heard, the truth is somewhere in between. Categories: China, Olympics, Travel | Tags: Beijing, Beijing Olympics, China | Permalink.